Register Log In ECN Forum Forums Photos for General Discussion Where Was This Photo Taken? 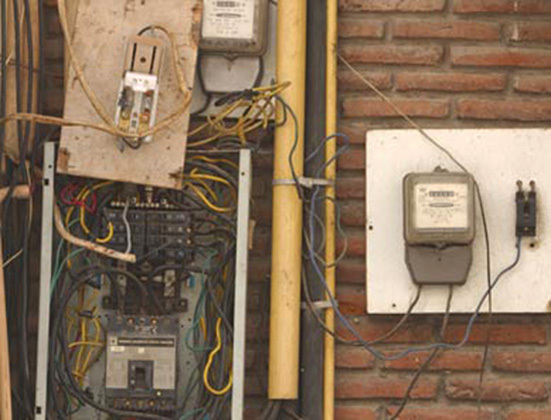 This photo was gleaned from a "Careers - Becoming an Electrician" website. I don't care where it is as long as I never go there and see/pass by it. Wild guess? Argentina. Where else will you find an "English" meter and an "American" panel? Likewise, the brickwork suggests mots of rain, but little freezing weather. May I guess here? I think the photo was taken in Thailand. Hmm, that looks like false advertising. I think it was taken at the display in the local Big Box store. South of the border...down Mexico way....or somewhere in Central America. The wires in the picture could easily be line side with the load side disappearing right through the wall.